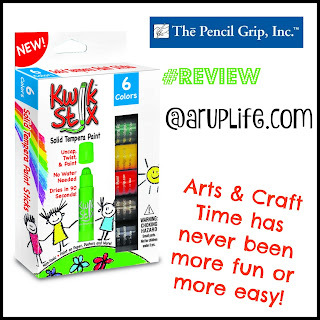 A RUP LIFE: Crew Review: Kwik Stix +Giveaway! 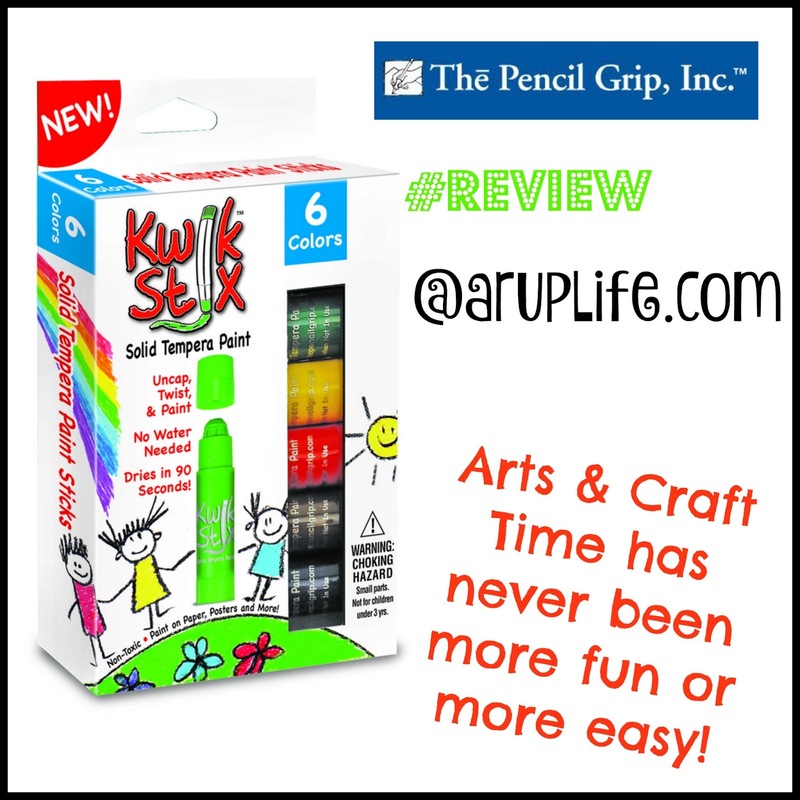 Crew Review: Kwik Stix +Giveaway! My five year old loves arts and craft time. I have to admit I come up at a loss of new things for him to do. I look for things that are easy to use, easy to clean up, and easy to pull out. I don't always have the time to set up an elaborate crafting activity. Kwik Stix by The Pencil Grip, Inc. really helps me out! These are chunky sticks of solid tempura paint. Think of a glue stick but with paint. They are easy for little hands to use. The product formulation allows it to quicker than regular paint. The colors are bold and bright and really show up on all of your paper types. These sticks are not for detail painting (because of their chubby design) but they are great for using in many projects. We've used them on ceramics in the past and on canvas. They can be used on many surfaces - really just use your imagination. For this review I decided to bring out some stencils for my little guy to color in. It was easy to do - all we had to do was tape the stencil to the paper. Then Jace easily filled in the spaces. It dried super fast and did not bleed under the stencils at all. I was able to wash my stencil off in the sink with soap and water which was awesome because it is all clean for the next use. You can see how bright the pink and red really are. As you can see they worked well with stencils. Unlike a true paint which would have bled under the stencil these stayed in place and set fast. I also attempted to make a puzzle with some Popsicle sticks. This was pretty easy to do. I just took a sharpie and drew the letter "J". Next I had him fill it in with his favorite color - Yellow. If you want to make a puzzle with them I recommend using the larger style popsicle sticks because I think it will work a little better. It didn't make much difference to my son because he played for some time with the puzzle. Yellow is his favorite color! I love how simple these are to use. They dry quick which means way less mess. I watched my son playing today and realized he was leaning his hand in all the places he had just 'painted' but they were already pretty dry so there was no transfer onto his clothing. That was a big win for me! I also like that it washed off my table and the stencil - this was an easy craft to clean up. There is quite a bit of product in the tube and I feel like we've used them several times and haven't even made a dent in the product. These are truly a hit in our household. One lucky reader will win a pack of Kwik Stix! Check out what the other reviewers created with their Kwik Stix! ARupLife.com received product, press or compensation to facilitate this review. This post may contain affiliate links. We only give our honest opinions of products. This post is in accordance with the FTC 10 CFR, Part 255 concerning the use, endorsements or testimonials in advertising. My favorite color is yellow. Thanks for the giveaway! interesting use with the paint sticks. Did you use them for anything else? Annette - thank you for stopping by and commenting. We have used these on wood (Popsicle sticks), ceramics and paper. I think they would work well on a variety of surfaces. I love the bright pink color! My favorite color is violet. My favorite color is yellow. My favorite color is lavender!